- The total has gone UNDER in 9 of Northern Illinois's last 13 games, however, the total has gone OVER in 4 of Alabama-Birmingham's last 5 games. - Alabama-Birmingham is 8-3 ATS in its last 11 games and 9-2 SU in its last 11 games. - Northern Illinois is 4-2 ATS in its last 6 games and 7-2 SU in its last 9 games. All Boca Raton Bowl prop bets and odds are available here via FanDuel Sportsbook. Away Team (Northern Illinois) Total: Under 20.5 Points (-110) — The Huskies have a strong defense, but their offense has not been able to keep pace. Look for that to continue against UAB, as the Huskies have struggled to protect the Quarterback all year, and are facing a defense that ranks second in sack percentage. 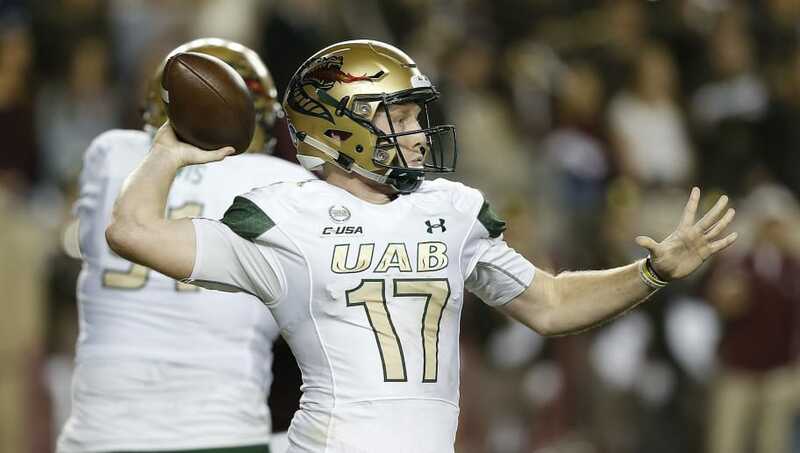 Home Team (UAB) Total: Over 23 Points (-110) — While the Blazers have only hit the over in 38.5% of their games this season, the total has gone over in 4 of their last 5 contests. Expect the Blazers’ offense to stay hot and exploit a Huskies defense that’s allowing 238.2 passing yards per game, good for 76th in the nation.